Heart Shaped Serving Tray. 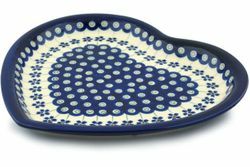 Our Polish Pottery serving tray is made of durable stoneware, beautiful for serving or displaying foods. Each Heart Shaped Serving Tray is designed and handcrafted at Zaklady factory in Boleslawiec, a Polish town famous for fine stoneware dinnerware.